Memorial bookmarks are the ideal funeral gift for someone who loved to read and also loved to garden. Adorned with a plantable butterfly infused with forget-me-not seeds and a fitting poem, guests can plant the seeded butterfly and watch the blue flowers grow. Personalize the top with a dedication such as "Plant this butterfly in loving memory of Jennifer Louise Miller"
The bottom has space for a poem such as a poem about butterflies. Visit butterfly memorial seed bookmarks for ordering and suggested poems. 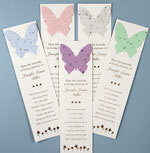 The bookmarks are available in pink, blue, green, purple or white. They can be ordered in assorted colors, with a minimum order of 25 cards in each color. Also available are cross memorial seed bookmarks and heart memorial seed bookmarks. "God called him/her home, And heaven's gardens are more beautiful. Plant this cross and wildflowers will grow in loving memory of Christine Johnson." "Plant this cross and wildflowers will grow. In celebration of Chris Thompson's life"
The crosses are available in pink, blue, green, purple, yellow or white. 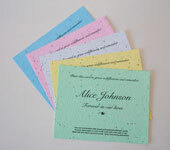 They can be ordered in assorted colors, with a minimum order of 25 cards in each color. Place these cards on a memory table as friends and family enter the life celebration. 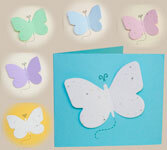 The Butterfly Forget-me-not seeded favor is a square card with a seeded paper butterfly on the front. The butterfly's wings are folded outwards, giving it the appearance of flying off the page. Plant the butterfly and it will bloom into beautiful blue forget-me-nots in memory of your loved one. The inside of the card is personalizable on both left and right sides. The back of the card contains planting instructions. The butterfly comes in white, green, blue, purple or pink. The paper card is available in cream, yellow, and blue. Plant the heart and flowers will grow in memory of your loved one. The handcrafted paper contains either a variety of annual and perennial wildflower seeds or forget-me-not seeds. Eco-friendly: plant the heart shape and turn your memories into flowers. Up to three lines of personalization included at no additional charge. The wildflower heart comes in cream with a white heart. The top of the card says, "Plant this heart and wildflowers will grow". A personalized message can be added on the bottom. Click here to see a list of the flower seeds. 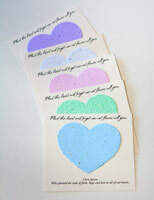 The forget-me-not heart card comes in cream or blue, with purple, white, pink, blue, or green hearts. The top says, "Plant this heart and forget-me-not flowers will grow." Wildflower cards are also available in this format. 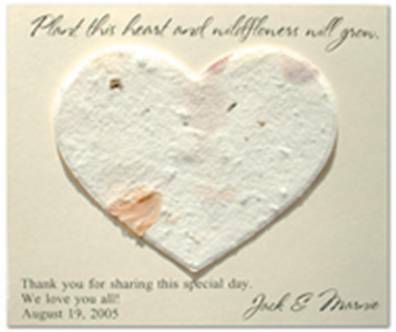 The entire card is made of seed paper and is plantable and personalized. They come in 5 colors: blue, pink, white, yellow, and green. 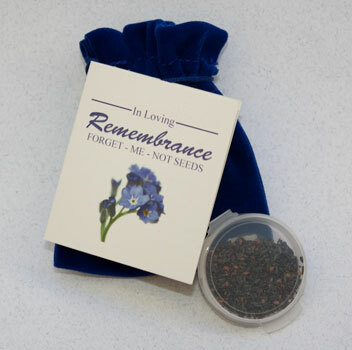 Forget-me-not Seed Pouches are a Renaissance Urns original. Forget-me-not flowers symbolize the everlasting memory of the deceased. The high quality velvet pouch contains approximately 9,000 forget-me-not seeds and covers up to 25 square feet. The attached card says, "To everything there is a season. In the planting of the seeds, we celebrate the life that has passed in the beauty of the flowers. May they bring a smile to your heart." The right side says, "Commemorating a life lived". Funeral directors: please call to offer these to your customers.